Larry and Sherrie Ruschmeyer hit the slopes to support their son who was diagnosed with ocular melanoma. As many of you know, in 2010 our son Nicholas heard the words “You have cancer.” At 20 years old, his young life changed in a heartbeat. Nick was diagnosed with an extremely rare form of cancer, an ocular melanoma. The biopsy indicated that his left eye had to be removed; the following year the cancer spread to his lungs. He faced this challenge with courage, strength, determination, and hope. After 8 years, unfortunately over the Christmas holidays, Nick was diagnosed with two large tumors in his brain which were immediately surgically removed. He is currently undergoing aggressive immunotherapy treatments at Yale New Haven Hospital. Nick is the strongest, bravest, young man that I know! He continues to inspire everyone! He will beat this again and return to his mountains in Vermont….he has places to go, a new house to build, mountains to climb, and snow to ski. Nick graduated from Johnson State College in 2012 with a degree in Outdoor Education – Adventure Leadership, spent a month in Alaska taking courses in Heli-skiing and Winter Expedition and spent a summer as a rock climbing instructor. Nicholas is employed by Jay Peak. He is co-owner of LYNX MOUNTAIN GUIDES OF VERMONT. We SKI and RIDE for Nick! We honor him and support the American Cancer Society with the funds that we raise so that others who hear those dreaded words “you have cancer” can live their life to the fullest as well. Our money helps support the research for metastatic ocular melanoma. Please join our team, or support our team. In 2018 Team NickStrong was the top fundraising team at the Hope on the Slopes event raising $10,630.00! Let’s see if we can beat our own record for 2019! Please click on the link below to donate to team NickStrong – Thank you for your support! New England Landscape & Management Inc.
Lynx Mountain Guides offers a diverse mix of guided outdoor experiences. Nothing beats exploring a new sport or landscape with a local expert. 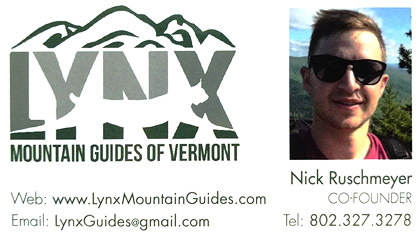 If you are looking for an adventure in the mountains of Vermont, contact Nick, your guide to the exciting side of life!